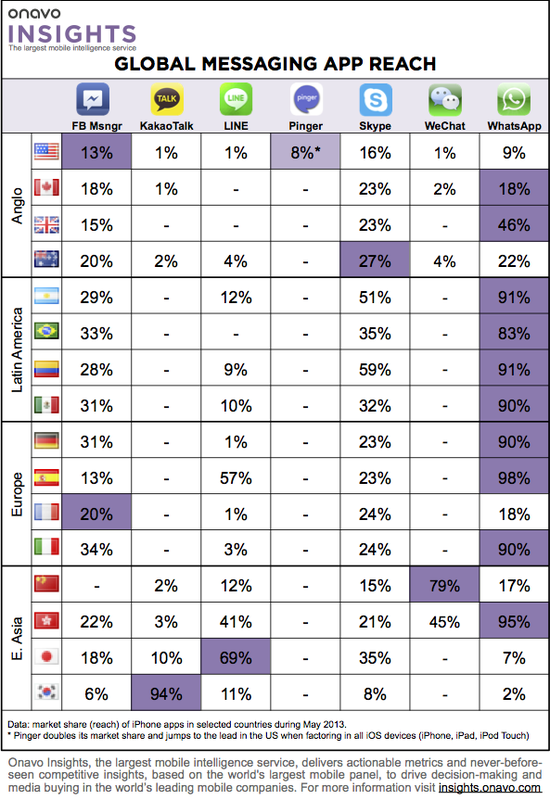 What’s Fueling Growth In The Fragmented World Of Messaging Apps? Immigrants. Even though it might seem intuitive that one messaging app will rule them all, WeChat, Line, WhatsApp and others are proving that messaging remains a stubbornly fragmented category with many geographic regions of the world seeing different leaders. KakaoTalk rules in South Korea, while WeChat dominates in China, while Line rules in Japan and the U.S. has no overwhelming leader. One thing that’s interesting to note is how these apps are growing outside of their home markets. They are, in fact, spreading through immigrants, according to app tracking company Onavo. So immigrants aren’t just bringing their languages and cultures to new countries; they’re bringing apps too. The company is basing its thesis on correlations between usage of different apps in the U.S. market. Onavo has a couple data compression and management apps that several million people use to manage their data. Because they track data flowing in and out of every app, they have a gauge on which apps are actively being used at any time on an anonymous, aggregated basis. They, for example, found that U.S.-based users of foreign messaging apps were several times more likely to use international dialing apps and dictionary or translation apps related to the home country of their messaging apps. That hints that they might be first-generation or recent immigrants. KakaoTalk users are much more likely to also use other Korean apps, like Viki, which lets people watch Korean TV dramas. WeChat users in the U.S. were 61 times more likely to also use Chinese social network RenRen, 56 times more likely to use a Chinese-English Dictionary and 52 times more like to use QQ. Line, which dominates Japan with 69 percent of iOS users in that country using the app on a monthly basis, has much smaller reach in the U.S. market. But U.S. users of line are 11 times more likely to use WeChat and eight times more likely to use KakaoTalk. WhatsApp, the Silicon Valley-based messaging company which has found 78 percent market share in India, reached new records this month with more than 10 inbound billion messages sent per day. Its U.S. users are seven times more likely to use an Indian TV app called NDTV, seven times more likely to use Bollywood Music Radio and six times more likely to use Bollywood music app Saavn. 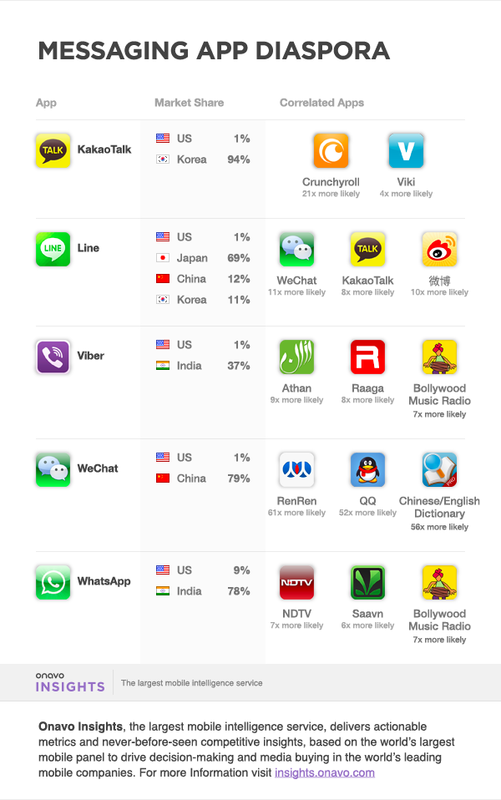 Viber, another app that’s found reach in India, has U.S. users who are nine times more likely to use an Islamic prayer tracking app Athan, eight times more likely to use Hindi radio app Raaga and seven times more likely to use Bollywood Music Radio. If immigrants are helping to spread these apps beyond their home markets, it bodes well for countries that have large and very spread out diasporas like China.